Your sightings of marked gulls will help with this research project to monitor the year-round movements of these birds. Even partial information is welcome (e.g. you saw a pink wing tag but missed the letter code). Report your sightings of marked birds by posting comments on this blog or emailing Dr. Ronconi at rronconi@yahoo.com . See links bar to “Other Gull Research” if you think you’ve spotted a gull from a different research program. What about green wing tags? Saw an adult Herring Gull with a green wing tag in St. John’s, Newfoundland on 21 August 2011. Too many feathers in the way to read the number. 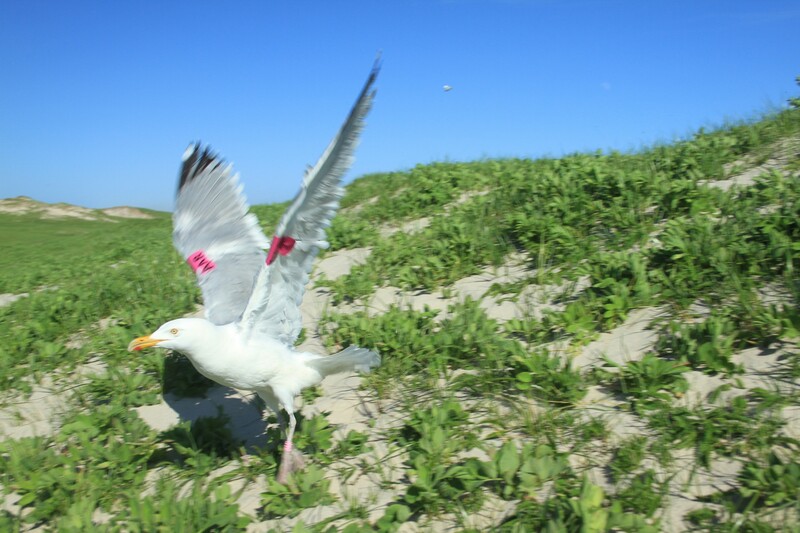 There are several projects using coloured leg bands on a variety of gull species, but only a few that have been using wing tags. One study from Massachusetts used green and blue wing-tags on Herring Gulls with the letter “K” on the tags. I suspect this bird you saw was banded during this study. Dan Clark is coordinating this research from Massachusetts and contact information is provided on the DCR Water Supply Protect Gull Study wesite. I’m sure Dan would appreciate some information on this sighting. Orange bands with that numbering combination have been used by the Canadian Wildlife Service in Newfoundland. I’m not sure which colony these were banded at. Greg Robertson at the Mount Pearl office has been leading this work and he would be happy to hear about this sighting. Thanks for the report. I saw a herring gull tagged AAF with one pink leg band and one silver leg band with other gulls on the Hudson River in Beacon, New York (USA) today, 1/22/12. Is this the same gull from Nova Scotia? If so, can you tell me more about it? Thank you. Yes indeed. We banded this gull June 9th, 2011, on Sable Island. This was an adult female captured at the breeding colony during the incubation period. Since the breeding season, she was spotted twice in early October at Beacon St. Dam in Glace Bay, Nova Scotia. Thanks for this report…I will contact you by email to get more details. I saw a gull with a green wing tag with the code A 302 on it, it was on its right wing. I saw it today in Cornwall, Ontario, down along the water, it was feeding near a group of ducks. I saw a blue tag on the left wing of a seagull today and yesterday . We’re fishing scaloppe 10 milles off St-anne-de-kent , NB . In Northumberland Strait . He was feeding and fallowing us all day . I saw a torqouise tag on a blackback seagull at the entrance to the Bras d’Or Lakes, just off Cape Dauphin, NS. Sorry could not read the letters/numbers on the tag because we were lobster fishing at the time. I have seen a black on pink wing tag. In St Anne’s Cemetery, Glace Bay . I will forward a picture of the gull. I can make out AA_ but i can’t make out the last letter. Do you get very many sighting from the interor of NY, Penn NJ? Last year we did get sighting reports of one bird AAF that was spotted quite a few times in interior NY and NJ. Here are a couple links to those sightings in March (click here) and earlier in January (click here). This was only one of the 21 birds we tagged last year but hopefully we’ll get more reports this winter. Today 1-19-2013 in Westchester county NY I saw a gull in a supermarket parking lot with a bright orange tag on its wing with the number 671 on it. Greetings, I just spied a gull with a dark blue leg tag marked C2T on the beach at Myrtle Beach, SC. (S)He was happily hopping about, trying to eat some bread crumbs from my wee little daughter. We took lots of pictures that I’d be happy to forward along with more info if it would be of use to anyone. Have I contacted the right person? Hello, I was at Burger King on Lafeyette road in (I believe Rye, but it may be Portsmouth, NH), and I was feeding the remains of my lunch to the Gulls when I noticed a band on one of their legs. It was hard to make out, but I believe it read “488”, I don’t remember the color for sure, but I think it might have been orange. Hope this helps someone. Thanks Shaun. This is not a bird from Sable Island but I’ve forwarded the details to other gull researchers who may know where it is from and will contact you if they know. While fishing today, my husband seen a gull with two pink bands. He has the letters written down, and will give me the info tomorrow. It was A?F is what he remembers off the top of his head. He seen it half way between Grand Manan NB and Nova Scotia. I will send more details when he gives them too me. That sounds like one of the gulls from our study. I look forward to getting the details. I took photos of a gull with a red tag at Lumsden Harbour, Newfoundland, on Friday, August, 2nd, 2013. Was told by people on the wharf that it has been hanging around there for at least a couple of weeks, feeding on fish debris, etc. Several others of the same species also p[resent. At 1990 hours Aug.03,2013 I spotted a Herring Gull with a PINK wing Tag # 991.It was feeding witha flock of other gulls on our lawn,following a heavy rain shower.We are located at Bass River Point NB at the juncture of the Molus and Richibucto Rivers.We are approximately 14 miles from the Richibucto Harbour. Hope this is of interest. August 7, 2013 I saw a Gull with round red markers on each wing, could not read any numbers. Cape Pele , New Brunswick on beach. Aug 16, 2013 Marked Gull with Orange round tags with black letters on both wings, Tag No: A 881, Red tag on left leg, location: Amherst Nova Scotia Canada ( Mall parking-lot ) bumming food. Saw pink tag 1001 at Old Orchard Beach, ME today. Spotted a gull with pink wing tags with AAF on them at Beacon Street dam, Glace Bay, NS on October 10, 2013 at 2:30 PM. Thanks for this report! AAF has been of our most frequently sighted gulls during our study and has been spotted at Beacon St. Dam each fall in 2011, 2012, and now again in 2013! Gulls seem to be amazingly faithful to their favourite stomping grounds. A Great Black-backed Gull banded with 6A1 black on right leg and a silver band on the left leg was in the parking lot near the jetty at Salisbury Beach State Reservation, Salisbury, MA on 6 Oct 2013 around noon roosting with the other gulls. thanks for the report. If you have any more details (tag colour, sighting date) that would be appreciated. Your email address doesn’t seem to work when i tried to write you. Saw a tagged Iceland Gull at 11:00 a.m. on Nov. 1, 2013 at Quidi Vidi Lake, St. John’s, NL. I wore two tags: One small silver one with no visible markings and one yellow tag labeled A4. Thanks Andrea and Claudia. I’ve had 10 reports of gull AAF since we started the project and it was tagged in 2011. 7 of these reports have come from Glace Bay so this seems to be a favourite spot of this bird: 2 sightings in Oct 2011, 2 sightings in Sept 2012, and 3 sightings in Oct/Nov 2013! The other three reports are from wintering grounds in New York and New Jersey. Please keep reporting AAF if he/she continues to linger around Glace Bay. See notes for photo on my Flickr page above. Location observed at 39.7196489,-75.5350399. It was foraging on organic debris and garbage with lots of other gulls (also observed 6 Iceland Gulls and 1 Glaucous Gull at same location). An eBird report will be available soon. We spotted AAF again at the Beacon St Dam, Glace Bay NS – he was having a snack with the ducks at around 2pm today. Hi Rob I see that your wing tagged Herring Gull AAF has been seen several times at the Beacon Street Dam in Glace Bay, Nova Scotia. Yesterday on Oct 7, 2014 my father and I spotted possible another of your Herring Gulls at the same location but with a different designation. The wing tag was hot pink and last two letters were AN the first letter was covered by wing feathers but it might have been an A. Does this match up to any of your birds? My curiosity would love to know. Keep up the great work it is fascinating to me. I saw a seagull outside a coffee shop in Bay Robert’s,Newfoundland & Labrador.It had a metal band on one leg and a larger blue band on the other with the #89A. A seagull has been showing up at my house lately around dinner time to eat with my crows. Yesterday it was perched on my grandmothers roof. I noticed it slid down the roof instead of flying. I thought never seen a seagull do that before. I wish could have made a video. I never saw a seagull roof skiing before! What really made me take notice is he has a tag! I know he will be back again tonight around dinner time. I am going to take pictures of him! Are you still banding nestling Herring Gulls with pink leg bands on the left leg? Saw seagull with a blue leg band with white letters marked 80A. Saw it at Canarsir pier in the parking lot with about 40 other gulls. He was acting normal and looked healthy to me, eating scraps of food from the floor and items thrown out by people. Could you tell me what type of seagull it is and where it was tagged at originally, whenever I’m at the pier I try to find birds with tags that I can seems info about. Herring Gull with pink band, white lettering ALL, in North Sydney, Nova Scotia today, 26 February 2017. It was loafing in a parking lot where people feed the gulls at Indian Beach. I presume this is one of the Sable Island gulls from about 2011 by the pink band. David McCorquodale, Georges River, NS.